Fourteen-year-old Eliza lives in a small 19th century English farming community. Her life is routine: tending the younger children, doing household chores, helping on the farm . . . until one stormy night when the wind blows down the old elm tree beside the cottage. What they find the next morning will change Eliza’s world forever. The young man pinned under the tree is James Dix. He recovers, and Eliza’s father hires him to work the farm. James is handsome, red-haired, and charismatic. Eliza doesn’t like him, though the rest of her family is enthralled, especially the babies. James, it seems, has a penchant for young girls, and they for him. It doesn’t take long for their big sister to fall under his spell. Gradually Eliza learns how dangerous James is because bad things seem to happen to any female with whom he associates, and he always has an excuse why it isn’t his fault. This time, he blames Eliza. ‘Is there nothing I can do to stop you?’ I cried. Eliza can’t escape. She doesn’t dare tell anyone what she knows of James’ crimes. Her life is now bound to his, so she merely accepts their fate as it rushes toward its inevitably lethal conclusion. Mary Cole is a 21st century housewife running from personal tragedy. When she and her husband Graham buy the old cottage in a remote English village, she hopes it’s the beginning of a new life, escape from the memories of their two young daughters’ murders. She soon finds it otherwise. Mary’s neighbors are Deborah and Eddie. In spite of Mary’s reluctance to socialize, she finds herself pushed into close contact with them, liking Deborah, but finding Eddie . . . odd. He forces himself into her personal space, popping up at odd hours, phoning her for long chats. Mary tells him to stop, to go away, but he blithely ignores her pleas. Mary senses the cottage has a presence. Her stepdaughter also feels it and refuses to come there. They both say they’ve seen people who aren’t really there. In the end, Mary Cole learns of Eliza’s fate and also how to accept her own. 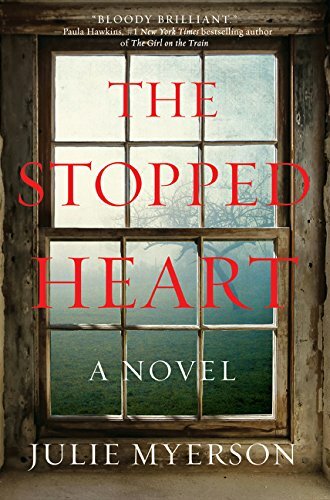 With its juxtaposition of past and present, some readers may find The Stopped Heart initially confusing, especially since the sections set in the past are written in the first person with little or no punctuation, and the present is in the third person present point of view. The story, though running in parallels, appears as two novels in one. Nevertheless, this is a well-written, often unsettling narration. The characters are engaging while being chilling, especially the psychopathic James. With Eliza and Mary’s fates running along similar lines, The Stopped Heart explores the theme that the past may live on in the present and time is indeed a river in which events converge, collide, and flow on together to an unavoidable future.